Successfully Added THL T9 Pro Smartphone - 5.5 Inch Screen, Android 6.0 OS, Quad Core CPU, 2GB RAM, Fingerprint Sensor, 4G, Dual SIM (Black) to your Shopping Cart. The THL T9 Pro is one of the latest phone offerings from the well established Chinese smartphone manufacturers and brings a step up in performance from the T9 model. With its 5.5 inch screen, the THL T9 Pro is well suited to media and games and the 720P resolutions bring forth fantastic graphics with a wide color gamut and good brightness. Equipped with the MTK6737 Quad-core CPU clocked at 1.3GHz and with 2GB of RAM the T9 Pro can easily handle games, HD movies with its smooth performance. With its Android 6.0 interface, you get the best and android has to offer and the Play store brings access to countless offerings for you to choose from. 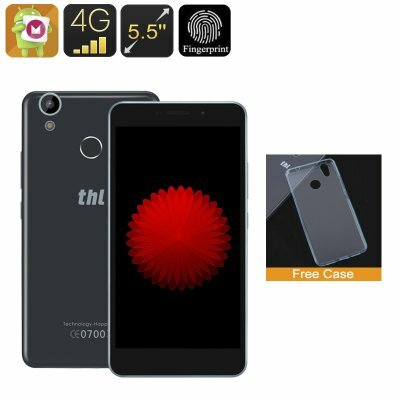 There are two SIM card slots on the THL T9 Pro and each of those offers 2G, 3G and 4G frequencies, so not only do you get access to the fastest cellular data around but you can manage multiple numbers as well - helping you organize personal and business contacts or avoid roaming charges when traveling away from home. Equipped with a fingerprint scanner you can protect your contact and data with state of the art security while having quick access with just the touch of a finger - so there are no more passwords, screen codes or pin numbers to remember. One of the best features of the THL T9 Pro is the 3000mAh battery, this provides up to 10 hours of talk time and can be used for hours of gaming or movie fun. An 8MP rear camera with its 16MP interpolated pictures ability will bring rich pleasing images with natural colors and great detail. you can also shoot HD video and with 16GB of internal storage and a micro SD slot offering up to 128GB of extra storage space, there is tons of room for even the most trigger happy photographers out there.